The Asus Transformer Book Flip TP200SA is solidly built and has a few niceties, but it's merely average in performance. I have a soft spot for small notebooks in the 12-inch range. To me, it's the perfect size for a go-anywhere notebook with a screen and keyboard that's not too small. So as you might imagine, I was excited to try out the 11.6-inch Asus Transformer Book Flip TP200SA. It's compact and lightweight, and as a 2-in-1 convertible notebook, it also doubles as a tablet. At first glance, it's a great portable machine in terms of size and features. And at only $349 (about £225, AU$479), it's a steal. Performance is lacking in some regards, but the Asus Transformer Book Flip TP200SA is powerful enough to cover your basic needs. Asus went with an understated look for the TP200SA, and it works well. A metallic top casing and palmrest give this low-priced machine a little more polished fit and finish than a basic glossy plastic chassis would provide. 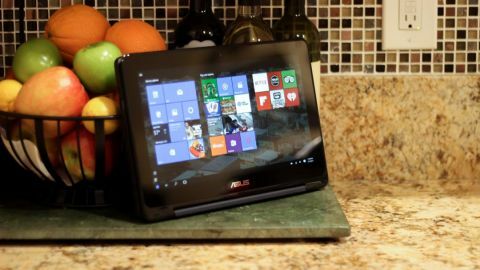 The 11.6-inch hybrid comes in a dark, almost black shade of blue, giving the TP200SA a clean, sleek look, but Asus also offers a silver-colored finish as well. The bottom case is ordinary textured plastic, which cheapens the case's feel slightly. Despite the cheaper bottom case material, the TP200SA feels solid, with minimal flexing or creaking. The TP200SA is a 2-in-1 notebook, which means that screen can open a full 360 degrees, allowing the notebook to double as a tablet. The hinge itself feels sturdy and it moves smoothly without catching. But it is a little tight, so you may have a hard time opening it one-handed. As is the case with most 2-in-1 notebooks, Asus had to make some compromises in the interest of serving two masters. Weighing in at 2.6 pounds, the TP200SA is light enough for occasional use as a tablet, but it's still a tank compared to standalone slates. It's lap-friendly, but you probably wouldn't want to hold it up for extended periods of time. Asus placed the power button and volume switch on the upper left edge of the notebook - a tablet-friendly spot. But if you're used to having the power button adjacent to the keyboard, you might be a little confused at first. The power switch's placement forces the TP200SA's ports forward, so they're right where you'd put your hand while picking up the notebook one-handed. It isn't a big deal most of the time, but it'll get annoying when you have a flash drive sticking out of the port. Keyboards and trackpads on small notebooks are often cramped, hard-to-use affairs. As expected, the TP200SA does shrink things down for space considerations, but it isn't all bad here. The TP200SA's keyboard feels surprisingly good to type on and provide plenty of tactile feedback and key travel. The keyboard flexes slightly, but it wasn't enough for me to notice as I worked. The keys themselves are slightly smaller than what you'll find on a full-sized keyboard, which can lead to more typos. I usually hate shrunken-down keyboards, so nice job Asus. The trackpad is merely OK. It's decently clicky and big enough to mouse around with ease. But I'm not a fan of the trackpad button situation with the buttons integrated into the trackpad itself. I find that it's too easy to accidentally right-click since there isn't any tactile indication of where the right click button starts and ends. It's a minor gripe in the grand scheme of things, but it gets in the way frequently enough to become obnoxious. Unfortunately, this arrangement is commonplace on modern notebooks, so if you're not a fan of this setup, well, you have little choice but to just deal with it. The trackpad supports a handful of multitouch gestures, such as two-finger scrolling, and pinch-to-zoom. Unfortunately, all the extra touchpad commands work terribly and there doesn't seem to be any way to turn these gestures off. I'd love to see Asus make the gestures—particularly scrolling—more responsive than they currently are.